In a refreshing change from the usual luxury cars and SUVs, Superstar Amitabh Bachchan bought the Mercedes-Benz V-Class. Mumbai: Among the many car enthusiasts in Bollywood, Superstar Amitabh Bachchan has an interesting taste in cars and is known to enjoy driving in and around Mumbai. 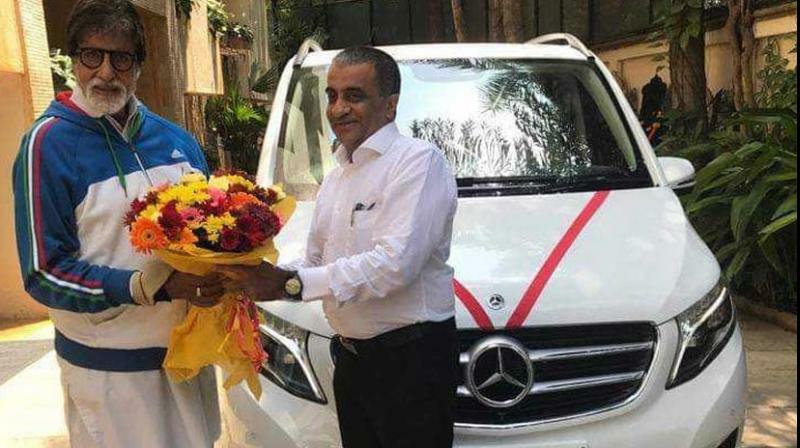 Adding to his collection, the actor took delivery of a new white coloured Mercedes-Benz V-Class luxury MPV at his house in Mumbai. Bachchan may have opted for that top range V-Class Exclusive Line trim available for Rs 81.90 lakh (ex-showroom, India). In a refreshing change from the usual luxury cars and SUVs most Bollywood actors choose, Superstar Amitabh Bachchan bought the Mercedes-Benz V-Class. These facilities allow you to use the car as a mobile office. Bachchan will most assuredly appreciate this feature. Amitabh Bachchan's has an attractive car collection. As per sources, his current daily ride is Lexus LX 570. Previously Toyota Land Cruiser 200 was his ride for many years. His garage has Mini Cooper S, Range Rover, Bentley Continental GT, Porsche Cayman S, among others. Rolls-Royce Phantom, Bentley Arnage R and even the Mercedes-Benz SL500 Roadster also grace his collection. We wish him happy driving in the new V-Class which may make his commutes more comfortable.